. :: ENDURANCE CLINIC & FEI RACE IN NAMIBIA WITH VIRGINIE ATGER ::. A unique experience combining horseback safari to observe African wildlife with a training course or an introduction to endurance riding on superb thoroughbred Arab horses. A comfortable lodge, a private ranch inhabited by wild animals, superb and healthy Arabian horses, friendly and passionate guides – these are the ingredients that make up this trip to Namibia. Varied days of riding to get close to the African wildlife, galloping with gnus and gazelles and endurance training in the heart of the African bush. A comprehensive approach to endurance, theory and practice with Virginie Atger, with very well trained and ranked horses that will be able to complete an official endurance course with grace and elegance. 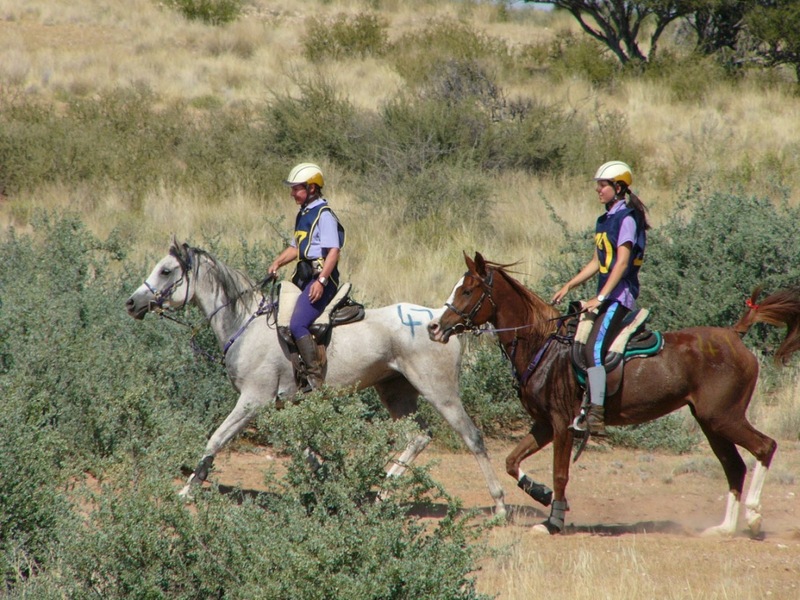 The ride in Okahandja is a technical ride with very varied terrains –from hard rocky ground to deep sandy river beds and anything in between– and is infamous for its relatively high percentage of horses eliminated due to lameness. Because it is a CEI/FEI 2-star ride and the last qualifying ride before the ‘big’ Walvis Bay ride (end of August), approximately 100 horses are expected (NERA and FEI-distances combined). All loops will start and finish at the same point (Okahandja Reitclub) with a grooming and holding area. On the loops after approximately every 7 km there will be water available for the horses – no water/drinks are supplied for the riders and no vehicles (and therefore no grooming) are permitted en-route. This means that the riders will either ride with a camel bag or wait for water when back in the holding area. You need to be aware that it may happen that there’s bad or no cell phone reception en-route. Permission for the journalist/photographer to be on the route has been given. Regarding the organisation: all entries must be electronically done and paid for 2 weeks before the ride (Namibia is one of the first countries to use an electronic entry system), specifying the weight class: no-weight (any weight – could be from 10kg to 200kg), standard weight (between 70kgs and 95kgs) and heavy weight (from 95kgs and up). Young Riders and Child Riders do not weigh in. Once at the venue (Friday before the ride) horses will go into their designated stables and security will be there for the next 2 days (no horse visits allowed after 22.00 hrs on Friday evening unless written permission from vet). Weighing in will start at 14.00 hrs and pre-vet check will start at 14.30 hrs till 18.00 hrs. This leaves time to check into the hotel, go for a short ride to loosen up horse and our muscles. The pre-ride briefing where route and rules & regulations will be explained, will start at 19.00 hrs followed by dinner. All horses must be influenza-vaccinated by a vet not later than 8 days before a ride. All horses must be vaccinated by a vet for African Horse Sickness. All vaccinations must be written and signed for by vet in the horses’ passports. Flight from your nearest airport to Hosea Kutako international airport near to Windhoek, the capital of Namibia. From Paris the flight time, with a stopover, is around 14 hours. Direct flights from Frankfurt (flight time of 10 hours). Dinner and night on the flight. Monday 17/06/2013. Windhoek - Okapuka - Night at Lodge. Upon arrival in Namibia, your guide will welcome you at the airport and take you to the ranch, around an hour away from the airport. We will go through Windhoek - a large, cosmopolitan African town that still retains a hint of old Germany. We will enter the private reserve to arrive at our lodge where a welcome drink will be awaiting us. The bar, carved from a tree, opens out on to the lawn where gazelles, gnus and warthogs come regularly to graze on the tender grass. 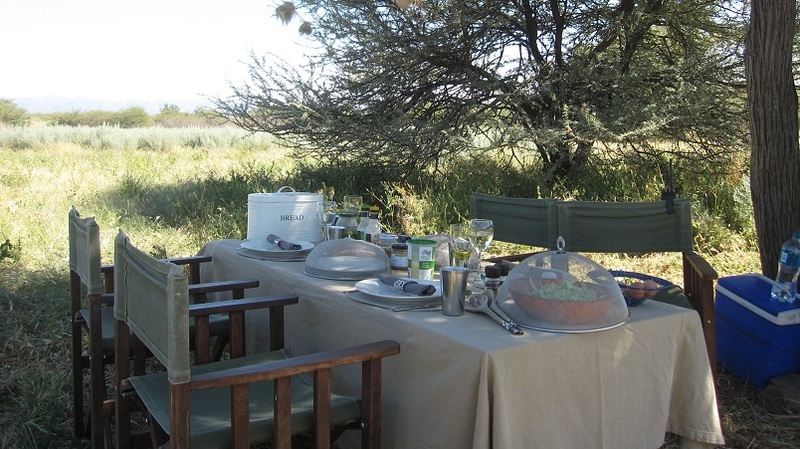 We will settle into our comfortable rooms and then have lunch in the large dining room with a view over the bush. Impatient to see the wildlife, we will set off on foot to the stables where our horses await us. Our charming horse riding guide, Sacha, will give us some safety advice before we set off on our first horse ride in the bush – a good way to get to know our horses. At the end of the day, after the long journey, we will enjoy unwinding at the bar followed by a delicious dinner during which we can watch the animals just next to the lodge. Night at the lodge. In the morning, after a hearty breakfast at the lodge, we will head to the stables for our horseback safari on the trail of the animals of the savannah – including gracious springboks, black and blue gnus, giraffes, rhinos and many others. After around 4 hours in the saddle, we will have worked up an appetite. Return to the lodge for lunch, followed by a pleasant afternoon relaxing, enjoying the peaceful park and the swimming pool, with a cool drink in our hand, watching the animals. At the end of the afternoon we will have our first training session with our second horse who will be our companion for the endurance part of the trip. In the evening, we will tackle the theory on the rules of competitions and the principle of veterinary checks, which are essential for this type of equestrian activity. Dinner at the lodge when we wish. Night at the lodge. Wednesday 19/06/2013. Horseback Safari - Endurance Training - Night at Lodge. Today we will begin our day with a horseback safari in the African bush, on the trail of the reserve’s wild animals. After lunch at the lodge, we will get back on our endurance horses for a training session on the sandy terrains of the bush, followed by a veterinary check to learn this practice in reality. Evening relaxing at the lodge bar, dinner and night at the lodge. After breakfast we will set off on horseback following the trails of the animals in the reserve, to complete our horseback safari. We will get close to ostriches, zebras, oryx with their beautiful black and white faces, and sable antelopes – the symbol of Angola, which are almost extinct but have been reintroduced over the last few years (their rarity makes them a very sought after and expensive animal). Return to the lodge for lunch and a break. Later on in the afternoon, we will get back on our endurance horse for today’s training session followed by a veterinary check. Evening in the relaxed ambiance of the bar. Dinner and night at the lodge. Friday 21/06/2013. Transfer to the Endurance Race – Night at Hotel/Guesthouse. Today we will leave the lodge and take the road to the place where the endurance competition takes place. The journey will take between 1 to 4 hours depending on the location of the competition. A great opportunity to see more of Namibia’s stunning landscapes. Upon arrival at the competition place, we will set up the space for the horses and make sure they are relaxed after the journey. The veterinary checks start at the end of the afternoon with weighing and then we will have a complete briefing on the rules of the competition and the course. The evening before the race in generally a convivial time and a great opportunity to meet other riders at dinner who are passionate about endurance riding. Early night to be on great form tomorrow for the competition. Night at hotel/guesthouse (depending on where the competition is taking place). Today is the day! Early morning start to begin the course at around 6am. We will prepare our horses with great care – the horse is our priority, and all the more so today. A groom can help us, but it is the rider who is responsible for their horse and who presents it for the veterinary check. We will set off together for the endurance competition. Our average speed will vary - depending on the distance, the terrain, the horse and the rider - between 14 and 19km/hour. At the end of the competition, after the final veterinary check, the prizes will be awarded for the best rider/horse duo. Before toasting the winners, we will look after our horse who deserves the very best treatment and care. For the riders, a good dinner and a good night’s sleep await. The day after the competition, the horses and riders need to relax their muscles. The horses are fed, we will chat over a cup of coffee and then it is time to pack up to set off on the road. We will leave at around 10am and the journey time will vary depending on where the competition has taken place. We will arrive back at our comfortable lodge and enjoy some time relaxing. We can watch gazelles, gnus and warthogs while we have our dinner on the veranda. Night at the lodge. N.B. This itinerary is given as an example and is subject to change according to the weather or any constraints relating to the endurance competition. - Individual silver medallist, endurance, 2006 FEI World Equestrian Games, Aachen, Germany. - Virginie has her own stud at the Haras of Jalima in Ampus, Var (South of France). Ingeborg, the owner of the ranch in Namibia, will be your host. She has become a true bush-woman since falling in love with Namibia over 20 years ago. Her niece, Sacha came to join her 8 years ago and shares her enthusiasm for this country and living with horses among animals that bring her pure delight day after day. 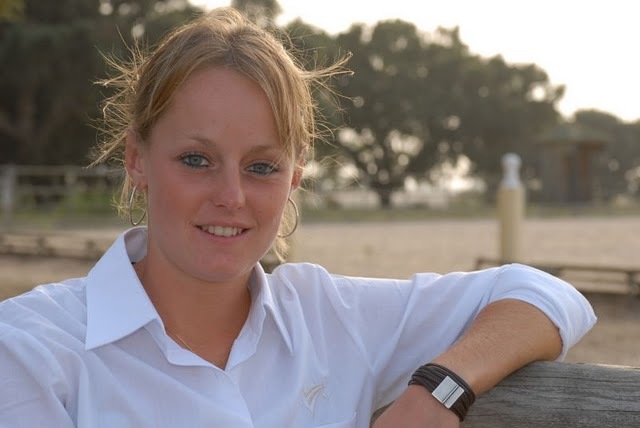 Sacha will be your horse riding guide and will open your eyes to the smallest foot print left in the sand. Ingeborg and the grooms look after the logistics to bring you lunches and pre-dinner drinks in the most marvellous settings. 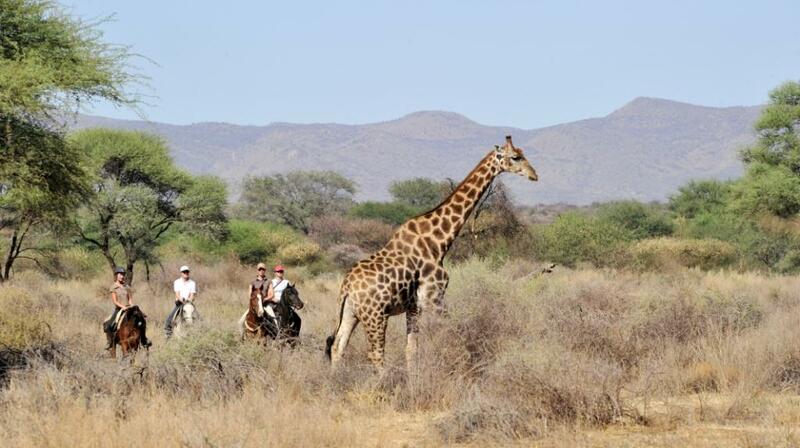 She will also accompany the non-riders on their 4x4 safaris to meet the riders. They are both permanently in contact with the lodge via walkie-talkie, in case of any problems. As dressage riders from a young age, they are both passionate about Arab horses and endurance competitions. They have both competed in international competitions and their horses are often ranked among the best. Their passion is equalled only by their warmth and friendliness and they will welcome you as friends to the ranch for your stay in Namibia. Your horse will be fed and prepared for you by the staff at the ranch. However, you will be asked to take care of your horse in order to build a bond with them. After each ride, you will shower your horse to cool him down and remove the dust from his coat, even if he will delight in rolling in the sand as soon as he goes back to the paddock! The high quality stables are one of the ranch’s major plus points. The owners and equestrian guides are enthusiastic, sporty riders and have chosen to work exclusively with Arab horses. Of the 30 horses at the ranch, 25 are thoroughbred Arabs and most of these are Egyptian Arabs. These horses have a lively temperament, but are also very reliable and sturdy. They are the ideal companions for maintaining a steady pace, even in hot temperatures. The horses have been selected in South Africa or America and some were even born at the ranch. Most of the horses have ranked at national and international endurance competitions. The horses live in large paddocks near to the stables and enjoy “holidays” in the meadow, on a vast terrain of 1500 hectares outside of the ranch. The horses are regularly trained in order to maintain their level of fitness and their way of life means they have a very good strength of mind – they love working and take pleasure in trail riding. It is a real joy to ride such contented horses, who love having fun and being ridden! Riders who take part in endurance training and the endurance competition will have two horses: one for the safari rides and one for endurance. To join in on this holiday combining horseback safari and endurance riding, you must be an experienced rider, comfortable riding at all paces over varied terrain. You must be able to control your horse in all circumstances. Riders should have a good seat and be comfortable riding at rising and half-seat trot and a half-seat canter and gallop over all types of terrain. You must be able to rapidly dismount and mount your horse if the terrain requires. You love horses and respect them. Your horse will be attributed to you according to your level of ability and an evaluation of your ability will allow the guides to establish the distance you will be able to cover. If you are a complete beginner, the maximum distance is 80km at a speed of 16km/hour. If you are a member of an endurance riding club, you can bring your logbook to add in the kilometres you cover. The final decision concerning the length of the competition you will be signed up for is entirely up to the guides. Requirements to enter the country: For French citizens: passport valid for 6 months after the return date. For other nationalities, consult your embassy for more information. Children under 18 travelling with their parents, no matter how old they are, must travel with their own individual passport, except for children under 15 on a passport issued before 12th June 2006 and valid 6 months after the return date. Important! It is obligatory for those travelling via South Africa to have a blank page in their passport. No visa is required for French, Belgian or Swiss citizens for a stay of less than 90 days. Any rider is allowed to compete in a NERA-distance. For all those riders that are a member of an endurance club a letter from the country’s endurance federation is needed, allowing them to compete abroad as the kilometres done in Namibia will be added to their total number of kms in their own country. All riders that are not a member of an endurance club are allowed to participate in a NERA-distance, but with a maximum distance of 80km and a maximum average speed of 16kms/hrs per ride. If endurance members have passed their novice class there are no speed restrictions and no maximum distance restrictions. No vaccines are necessary for travellers arriving directly from Europe. A Yellow Fever vaccine certificate might be asked for from those who have recently travelled to a sub-Saharan African country or South America. As with all travelling, it is important to be up to date with your vaccines such as DTP and TB. Vaccines against hepatitis A and B, whooping cough, typhoid and rabies are advised. For more information, consult your local health care provider. Malaria is only a concern in the northern part of the country, in the border zone between Angola and the Caprivi Strip during the humid seasons in Etosha Park. For a stay outside of these regions, preventative measures of protection are a sufficient (effective insect repellents, clothes that cover your skin at sun rise and sunset, impregnated mosquito nets). In order to guarantee a unique and personalised experience, groups are limited to 6 riders maximum (8 in total with Virginie Atger and Caval&go partner). During your horseback safari in Namibia, you will stay in a comfortable double room in the park, near to the main lodge building. The Park’s rooms are in bungalows with thatched roofs, divided into 4 spacious and comfortable bedrooms with a small private terrace overlooking the bush. 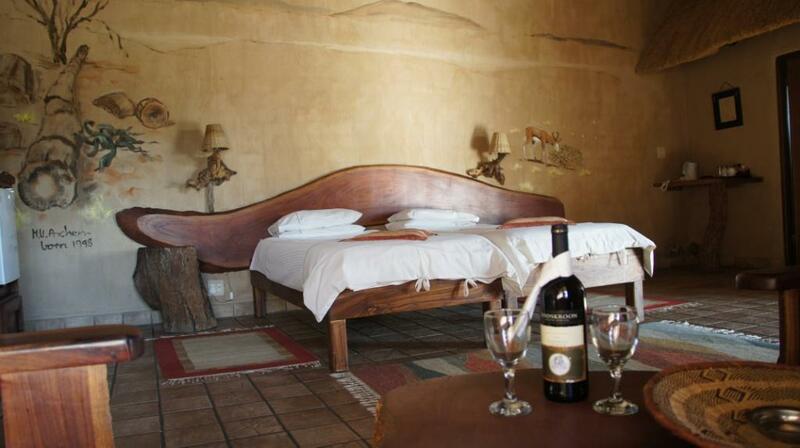 The rooms have solid wood furniture and walls with frescoes painted on them, depicting the landscapes of Namibia. The rooms at the park are equipped with a mini-bar, a telephone and a large fan. All rooms have an en suite bathroom, a safe, a kettle and tea and coffee making facilities. The lodge prepares high quality, hearty meals, with some bush-meat specialities as well as European dishes. It is possible to order vegetarian meals or meals for other dietary requirements. The wine list has a range of high quality South African wines. All meals are eaten at the main lodge building, at the bar or in the restaurant. These spaces open onto the park where animals come to graze on the grass or to cool down in the pond. The restaurant is closed off by a large bay window and separated from the bar by a small waterfall that then flows into the park. The bar is carved from a tree and is surrounded by large wooden chairs facing the park, and it is a great way to spend time with a drink in your hand, watching the animals. Wi-Fi is available at the bar. The lodge has a souvenir shop, a small swimming pool and a tennis court (bring your own tennis racket and tennis balls). Summer and winter are at opposite times of year to Europe. Namibia’s climate is generally very dry. From May to September it is winter and the dry season. Temperatures vary between 4°C and 22°C with a wide range of temperatures in the desert between the afternoon and the night. - Wi-Fi available at the lodge, at the bar or the restaurant. * Prices calculated according to currently known rates, subject to availability of flights departing from Paris, limited places available. For departures outside Paris, we can suggest flights, usually at the same rate. At the time of booking, if there is no flight availability at these prices, we will propose an alternative which may incur an adjustment in prices. Caval&go/ SARL CHAGRITAS AVENTURES reserves the right to adjust its prices in order to take into account varying transport costs and exchange rates applicable to the trip in question, or increases in price of certain services at the destination (such as the entry price at certain tourist attractions). See general terms and conditions of purchase.